The Tennessee River Valley is known for its many rivers, recreational lakes, and waterways that stretch across the region connecting rural communities to larger metro areas. Each year, millions of visitors are drawn to the promise of miles of whitewater paddling, tranquil flatwater, and the fun events that are held annually in the region. The Tennessee River and its seventy plus tributaries are widely known for the quality of paddling experiences and for the diversity of the shorelines, from vibrant cityscapes to densely tree canopied streambeds. The water of six rivers, Chattooga, Pigeon, Ocoee, Toccoa, Nolichucky, and Wild and Scenic Obed are known for adrenalin pumping adventures, where the roar of water and swirling eddies add to the experience. Whitewater season begins in early spring continues through early fall. The quality of water is dependent on seasonal rainfall and winter precipitation. This year, the waterways are quite are full and present challenges for novice paddlers. Check with local outfitters for conditions before venturing out on the water or schedule a group trip with a guide service familiar with the rivers. Equally fun are the stretches of flat water rivers or the impounded waters behind the dams, which provide miles of waterways to kayak, canoe, and SUP. Three recommended scenic paddling trails to explore are the Elk River, Duck River, and Bear Creek Scenic Floatways. Visitors will experience a mix of paddling and floating through scenic canyons, woodlands, waterfalls and bluffs on some of the most biodiverse ecosystems in North America. Each weekend from Memorial Day to Labor Day, the Tennessee Valley Authority schedules recreational water releases to keep the floatways navigable. 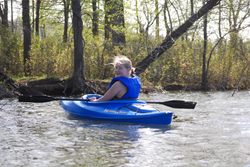 Youth Olympic Games- June 9 Huntsville, AL- Youth kayaking completion sponsored by Alabama Scenic River Trails. SUP Regatta-September 8- Norris Dam Paddle Challenge- Paddle board and Kayak categories with planned10 mile and 6 miles courses. Exploring the Valley by water is easier than ever. Three excellent planning guides to help you navigate your trip are the TN Water Trails, Alabama Scenic River Trails, and, of course, the Tennessee River Valley Mapguide. With the Tennessee River Valley Geotourism MapGuide, you can identify places to explore and share in their stories. With our interactive map, you can save trip ideas and build your own trip plans to see places around the region. It's time for you to share your stories and start some new ones!